The IMMUNOSET® HO-1 (human), EIA development set contains sufficient reagents for the development of 5 x 96 well EIA plates which provides analysis of ~200 samples in duplicate. Save time, money, and sample by developing your own EIA kits. Simply coat your plates and go! This kit provides superior accuracy with fully quantitative results compared to Western blot analysis and has low reactivity with related molecules. 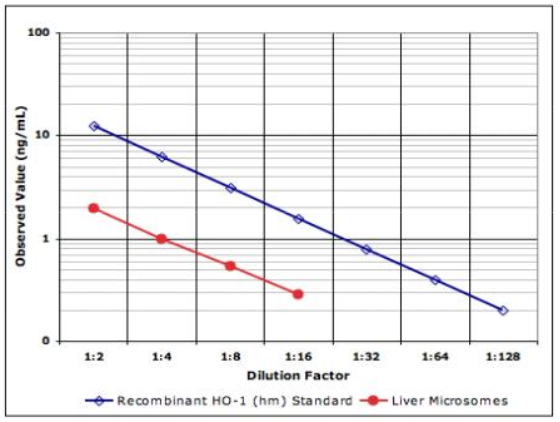 Application Notes: For the quantitative determination of human HO-1 in cell lysates and tissue of human origin. Crossreactivity: Specific for human HO-1; does not react with human HO-2 or HO-3. Scientific Background: Heme oxygenase (Hsp32) is the rate-limiting enzyme that breaks down heme to iron, carbon monoxide, and biliverdin, which is then metabolized to bilirubin by biliverdin reductase. In mammalians, heme oxygenase exists as two primary isoforms, the inducible isoform HO-1, and the constitutively expressed HO-2, both catalyzing the same reaction. HO-1 is expressed in erythrocyte and hemoglobin metabolizing tissues of the spleen, liver, and bone marrow, with localization to membranes of the ER, mitochondria, and caveolae2. HO-1 expression is induced in response to an array of oxidative stress-inducing factors, including heat shock, heme accumulation, hypoxia, UV radiation, nitric oxide, cytokines, and heavy metals.